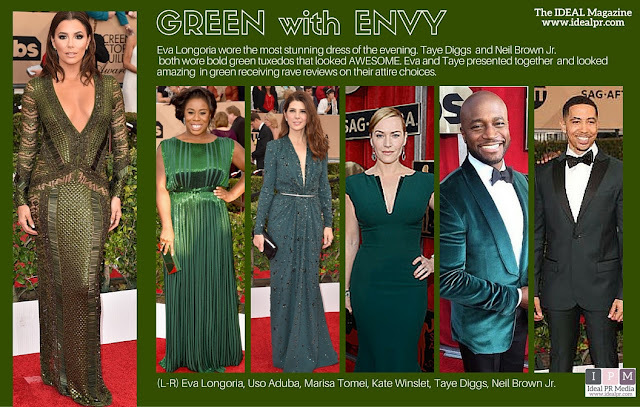 Eva Longoria, Uso Aduba, Marisa Tomei, Kate Winslet, Taye Diggs, Neil Brown Jr. wear green in a way that others envy. Eva Longoria wore the most stunning dress of the evening on the red carpet at the 2016 SAG Awards. Taye Diggs and Neil Brown Jr. both wore bold green tuxedos that looked AWESOME. Uso Aduba, Marisa Tomei, Kate Winslet and Carol Burnett (not pictured) all wore lovely green ensembles.